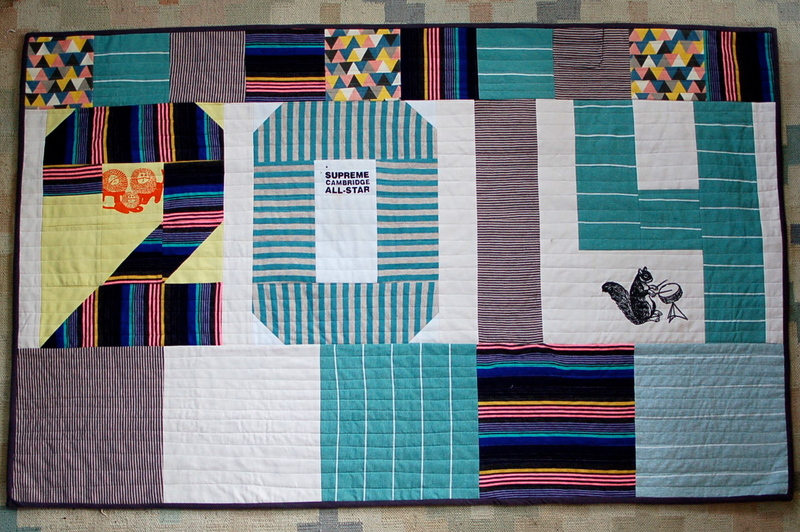 When planning May classes for Gather Here, Virginia asked me if I would teach a class on how to make a t-shirt quilt. Apparently the shop had some requests for one recently. It’s that time of year when folks think about making meaningful gifts for their graduating kids and might actually be able to steal away a ton of shirts while said kids are deep in the throes of finals. She added, “if the thought of making one makes you sick….” Why? Because when you read the phrase “t-shirt quilt” you probably made the same face the vast majority of people do, especially quilters, when they read or hear that phrase, too. Most quilters roll their eyes or shudder as if hit with a sudden douche chill when asked to make a t-shirt quilt. I thought about it for a moment and responded that if she knew of someone who was a t-shirt quilt genius, then they should teach the class. Otherwise, I would be happy to do it. Oh! 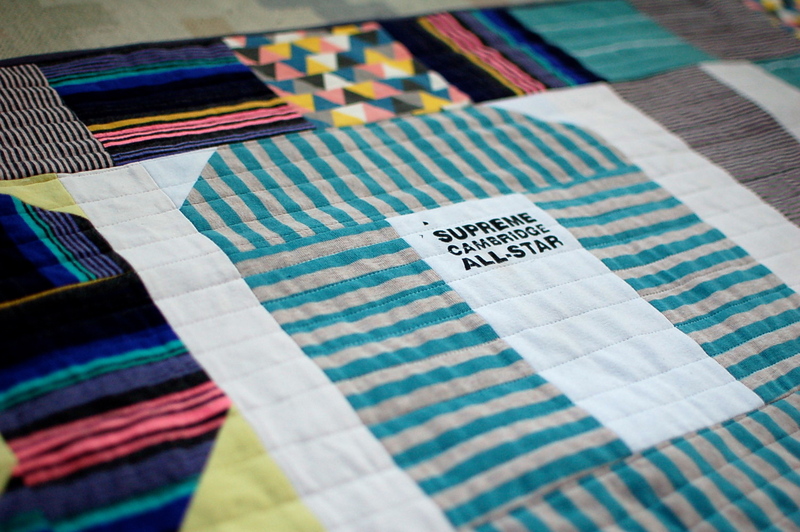 And by the way – how do I make a t-shirt quilt? Because I had never made one before. I was coming to terms with my craft snobbery. I was then introduced to this amazing thing called Shape-Flex. Have you ever used this before? It is seriously, ridiculously, mind-blowingly amazing. Really. It’s a type of fusible interfacing that makes knits behave like a woven. And it gives jersey this luxurious, suede-like texture that makes sewing it a pleasure. 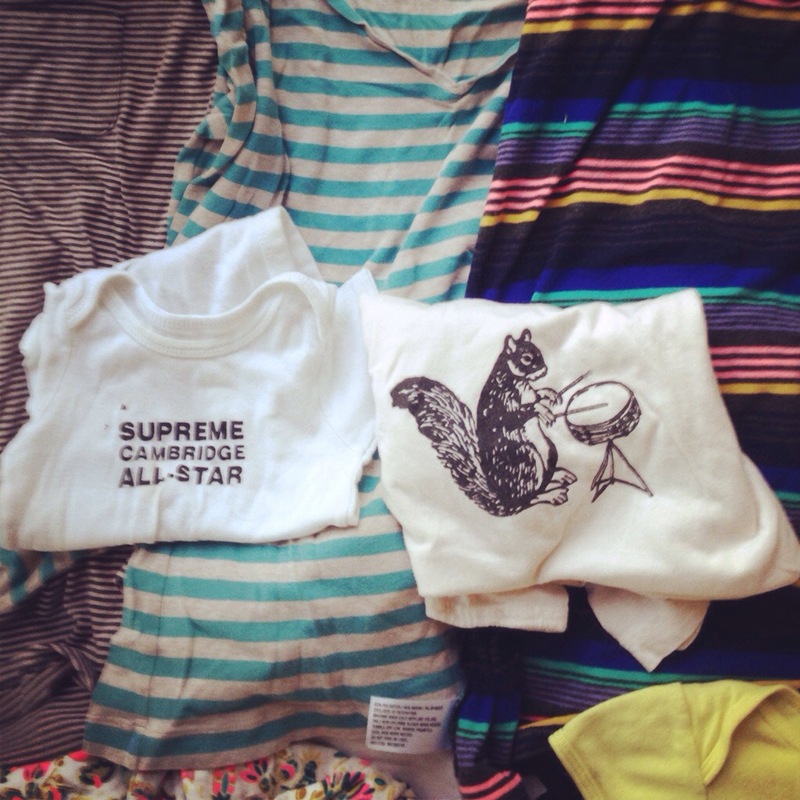 I didn’t have much in the way of old concert tees or obscure bands or sporty or campy or company picnic morale building stuff, but I did have a bunch of old nightshirts and Matt’s work tees that I planned to use for leggings for my daughter, as well as old onesies and toddler t-shirts. I played around with some designs and came up with this. Simple, easy, clear. Just the year and squares. A design that would be interesting, meaningful, and showcase the stuff printed on the tees while still integrating them in the overall design. Clearly, a design involving fussy-cutting was sure to speak to me. Then there was the texture of the knits. Shape-Flex made it so that cutting and sewing the tees was a breeze. The resulting pieces had such a satisfying hand – soft and buttery with clear, crisp seams. While I tried to go into this project with an open mind, I was surprised by how much I enjoyed the process and how much I liked the result. I loved making this! It was so much fun and came together so quickly. After I finished this and photographed it, I snuggled under it and entertained the idea of making a huge one for myself (and my gang of heathens). It drapes so beautifully and is just so darn soft. Did I mention how soft it is? Oh, it’s like wrapping yourself up in a million little baby angel butts. So soft! So cozy! If I had a ton of old t-shirts in a Kona cotton card’s variety of colors, I totally would make a super-duper-sized version. If you’re in the Cambridge area, and you want to make a super-soft, snuggly quilt that you will love and love out of a bunch of old t-shirts, come join me at Gather Here. I felt the same way about T-shirt quilts when someone asked me to make her one, but as it was the first time someone was offering to pay me for a quilt, I accepted the challenge. And once I figured out that the interfaced t-shirts could work just about like any other fabric, and I could incorporate them into pretty much any quilt design I wanted, I started to find the design process pretty cool. I’ve made two of them now, using a mostly improv style for the block layout, and have been really happy with the results. I used Pellon’s Fusible Featherweight interfacing (I think 911), but am intrigued now by your experience with Shape-Flex. That looks so comfy and soft! And nothing about it screams t-shirt quilt, really.